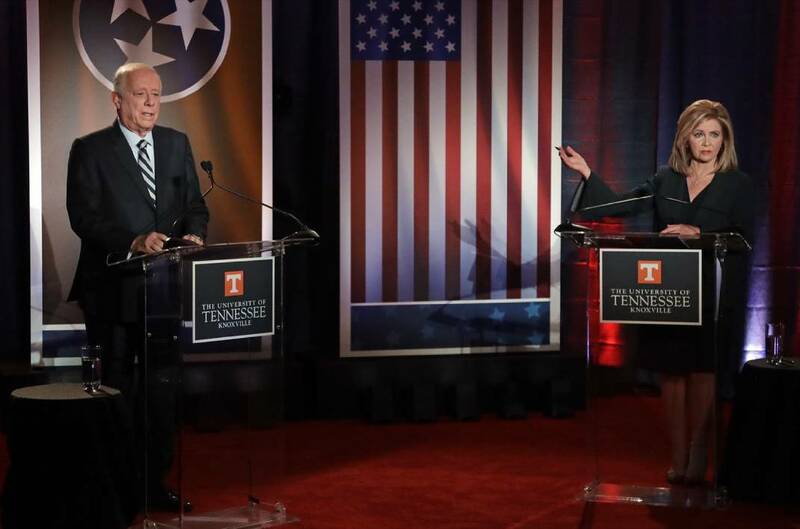 KNOXVILLE, Tenn. — Republican Congress member Marsha Blackburn and Democrat Phil Bredesen fought repeatedly during their second and final U.S. Senate debate Wednesday night from the first question straight through to their closing statements. During the hourlong debate at the Howard H. Baker Jr. Center for Public Policy at the University of Tennessee, the candidates tussled as Blackburn repeatedly sought to put Bredesen on the defensive over issues ranging from illegal immigration and gun rights to sexual harassment and the confirmation of Brett Kavanaugh to the U.S. Supreme Court last weekend amid allegations he sexually assaulted a woman at a party decades ago while both were in their teens. Bredesen, a former two-term governor who says he will be a moderate voice if elected, began the debate recalling the late Sen. Baker, saying the Republican lawmaker "stood in so many ways for the civility in politics," adding that he hoped for "that kind of civil debate." Blackburn countered by hitting Bredesen for attending a Tuesday fundraiser in New York City hosted by billionaire Michael Bloomberg, a gun control advocate, and she suggested they "talked about gun control and may have talked a bit" about Bloomberg's plans to run for president in 2020. She then went on to say it "took Phil a while to make his mind up" about Kavanaugh — Bredesen said just before the judge's Senate confirmation that he would have supported him based on the publicly available evidence after a quick FBI investigation. Blackburn also suggested Bredesen's delay in deciding "could have been because of the sexual harassment claims during his administration as governor" and criticized Bredesen over allegations of file shredding. "The voices of those women were shredded," Blackburn charged. "They died in that shredder." Said Bredesen: "That was possibly the shortest civil debate we've had in a long time." He went on to defend his gubernatorial administration's responses in 2005 to an alleged sexual harassment incident of a female staffer by a top male aide, saying the aide lost his job, changes were made in policy and more. "We had an issue with someone," Bredesen said. "We got rid of that person the next day." After their first debate, in which Blackburn repeatedly sought to link Bredesen to Senate Minority Leader Chuck Schumer, D-N.Y., Blackburn spent much of the time Wednesday night seeking to link him to failed 2016 presidential candidate Hillary Clinton and to former President Barack Obama. Blackburn, who is seeking to become Tennessee's first female senator, mentioned Clinton at least 20 times in the debate. They did manage to agree on a few things. For example, both spoke well of retiring Republican Sen. Bob Corker of Chattanooga, whom both wish to succeed. Bredesen noted that when he was governor he worked well with the senator and others to successfully lure Volkswagen to Chattanooga. But Blackburn blasted Bredesen for not supporting President Donald Trump's call for building a wall on the U.S. border with Mexico. Bredesen said a physical wall is more of a 20th Century idea, with a wall estimated to cost some $70 billion. He said he supported using new technologies, as well as beefing up Immigration and Customs Enforcement staff on the southern border. Blackburn, asked about potential costs of $70 billion for a physical wall, said "Walls work. Just ask Israel." While Blackburn hit the former governor on Bloomberg — Republicans on Wednesday released video of Bredesen and Bloomberg shaking hands outside Bloomberg's New York City home on Tuesday night — both she and Bredesen backed some gun restrictions. Both candidates raised their hand when asked if they support enhancing a "red flag" system aimed at detecting people with officially determined mental illnesses if they seek to purchase guns. The debate comes as national Republicans are pounding Bredesen on television and digital ads as they seek to retain control of the Senate. Bredesen had been ahead in some polls, but his lead has eroded in two recent surveys in the aftermath of the Kavanaugh controversy, with the latest polls showing Blackburn ahead. Early voting in the Nov. 6 election begins next Thursday.